Oh, and weed eating around trees, washing storm windows, shampooing carpet… the list goes on and on. And my parents and brother Tim and Sis-in-law Carrie have been SO helpful! Meanwhile some things have been happening behind the scenes for the girls’ bedroom at the new house! 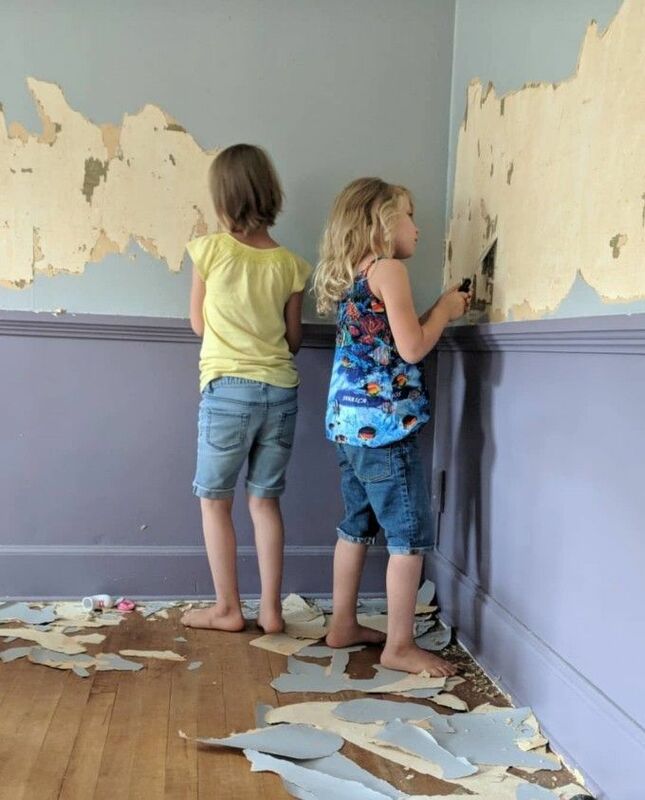 You might remember from our Instagram Stories that we removed all the painted-over wallpaper, mudded a ton of holes and cracks, and most recently, the floors are refinished! I have a Stories Highlight called ‘girls room’ on my Insta profile if you want to catch up. 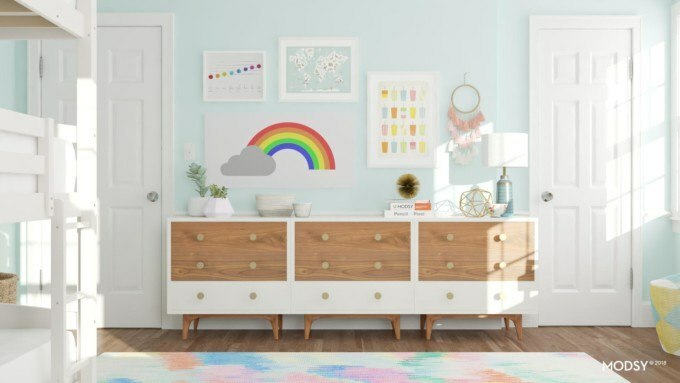 I was really struggling with layout and how to fit ALL THE THINGS in this room with it still looking cute and cohesive, so we teamed up with MODSY again to help us visualize pieces in this space! 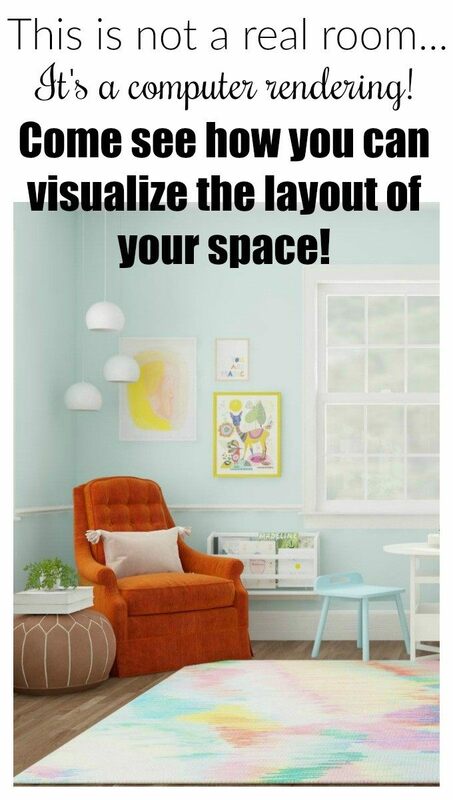 I so love that their service allows you to see your space in new and different ways, especially being able to visualize your space with different furniture layout options! 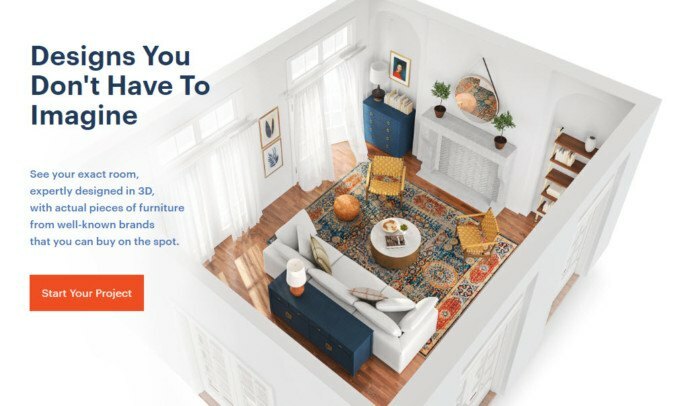 If you’re not familiar with MODSY, let me just tell you… they’re a company that has actual designers that help you picture your room with different furniture and room layouts by modeling it up in their shockingly real-looking software. You fill out a Style Quiz so their designers can get a feel for your design style (farmhouse? modern? boho? grandma chic?) Then send them some pics of your room (clutter and all!) and enter simple dimensions of the room. 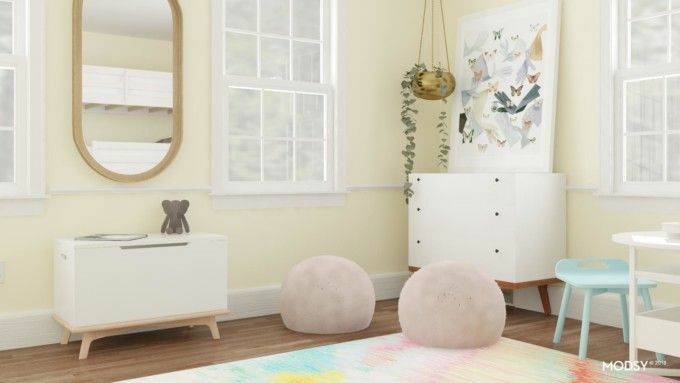 There’s even a place for you to let them know which pieces of existing furniture you have that you want to stay in the room, and snap a photo of it so they can add it into your room design. 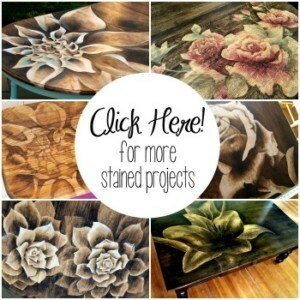 We provided them with a link to the rug we got for the room, and they added it to our designs! Then their designers go to work! Soon, you’ll get to open THEE FUNNEST email, with two completely different room designs. For each design, there’s an overhead view showing the furniture layout, as well as views from each corner angle. They even give you product links for the items that they added to the room. I love that they were able to put the triple bunk bed on different walls! I didn’t even think about it being possible to put it on that north wall, but I love how it opens up the middle of the room more for play. Now that you have your designs, you can mull it over and ask them to make revisions if you want to ‘try something else’ in the room. 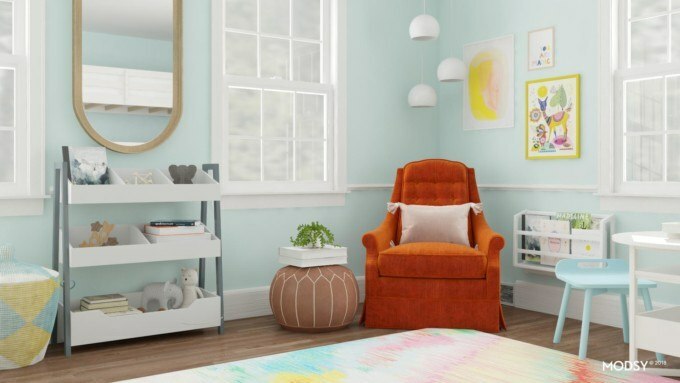 We ended up having them add the toy shelf and rainbow art we recently built, AND we decided to add their legendary orange chair! Isn’t this EVERYTHING? Doesn’t it look so incredibly real? 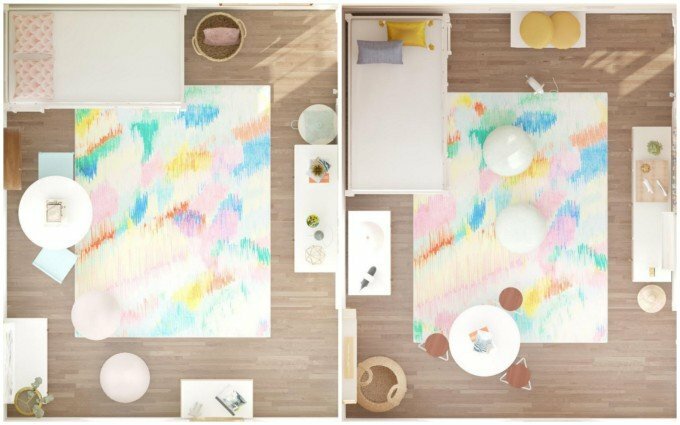 I’m going to show the rest of the angles of this room design below, so imagine you’re standing in the middle of the room and slowly turning left as you look at these pics. 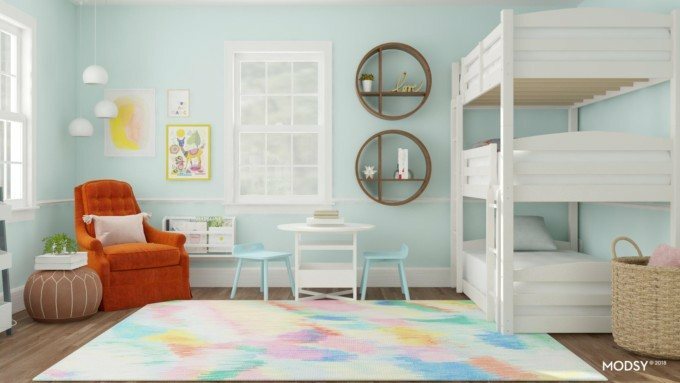 Since we had them take away the small dresser in the corner to make space for the orange chair, we asked if they could find a long/narrow dresser that has 9 drawers that are divided into 3 equal parts so that each of the three girls will have their own amount of drawer space. I wasn’t sure if what I was asking would work, but they pieced together 3 of the same smallish dresser to make this loooong credenza-looking dresser situation that’s PERFECT! And we’re totally going to DIY it. Stay tuned. 😉 Oh and do you spy our rainbow art too? I’m so happy to be able really picture the space and be able to plan accordingly! ARE YOU DYING at the cuteness? And how real it looks? After staring at these pics so much, I’m super disappointed every I walk into their actual room that’s just a big white empty box. We’re working on all the details and plan to start putting the room together soon. SO exciting! And the BEST news (for you!) 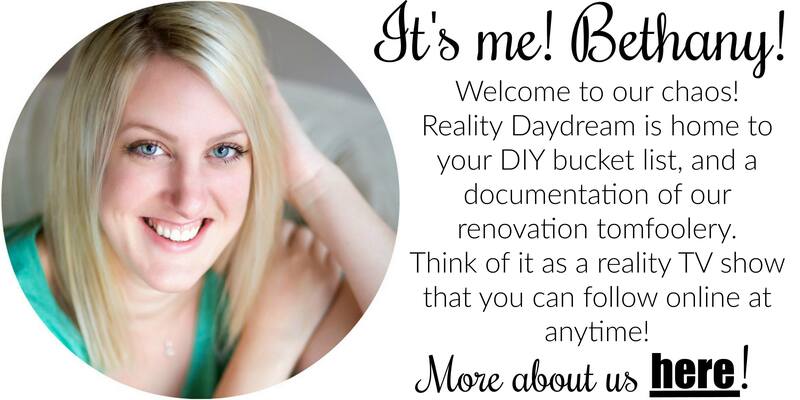 is that I get to offer my besties 20% off these design services with the code DAYDREAM20! I already know I’m going to have MODSY vhelp with our living room, because it’s such a massive long/narrow room, I have no idea how to do they layout. Oh! 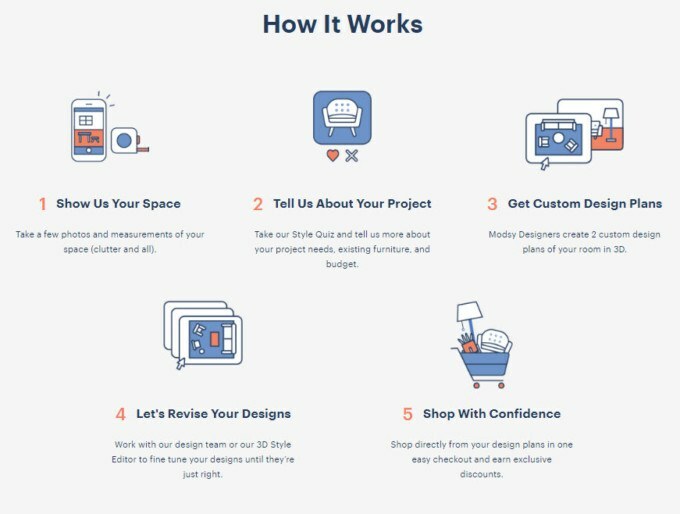 And another amazing thing about MODSY’s services is that if you and your spouse have totally different design styles, you can each fill out the Style Quiz and have the designer merge your styles in the room layouts they send you! Just let it be known that’s it’s FREE and inexplicably fun to take the Style quiz, so you just really should do it either way to find out your style! And comment below with your design style! I’m fascinated with this kind of stuff. Mine is Mid-Century Chic with a touch of Eclectic! 😉 I can’t wait to hear what yours is! Hey, I am a long time follower of your life and home. First, thanks for all you share and how real you are. I too have struggled with infertility and it’s beautiful to feel less alone in that journey (also, I have all girls and I homeschool, so there is that). Second, your home(s) is/are beautiful. Thanks for sharing that with the world. Third, I feel I need to let you/your other readers know that not all experiences with Modsy are positive ones. 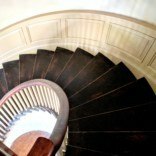 After reading about your two Modsy room design experiences, I purchased a design package with high hopes. However, I have never been more disappointed in money I have spent on my home heretofore. Ever. 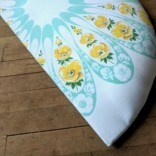 Like you, I am a DYI person and build/reimagine pieces from scratch/from inexpensive pieces I get from IKEA or yard sales. I also am good at design. I am an artist with a Master’s degree and my art training has always come in handy when designing a room. I have never needed assistance putting things together until a recent move. 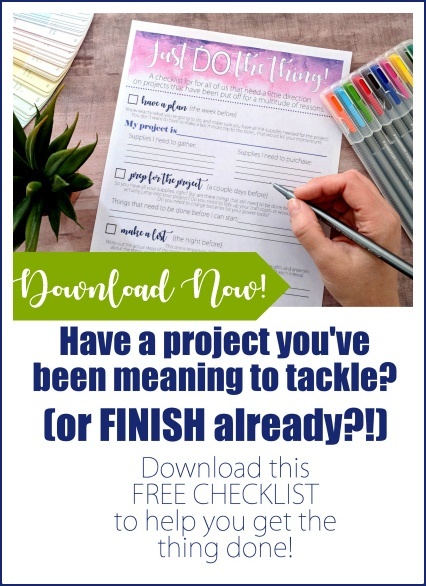 I have a space that is weird and too much on my plate with young kiddos and work, so I tried Modsy, hoping they could help me solve issues with a challenging space. My experience was not a good one. Largely, my requests and desires were not honored-the team was adamant with keeping a bed up against a wall even after I had asked that it be moved to a different place. Some of my requests were addressed with “we see you wanted…we are not currently able to” statements. Why do you think I purchased this package in the first place? Because I wanted to see how the space would work if we moved a shelf from wall to another and put a guitar hook on a different wall with a gallery of other art etc. and to give me some options for closet doors…all the things Modsy is currently unable to do. If it were just about finding furniture or using the furniture I have, I could have done that on my own, but I had needs and wanted assistance with a few things and turned to Modsy and was, as I stated before, very disappointed. My interactions with the Modsy designs and their team largely focused on trying to sell me products I don’t need/did not ask for. I don’t need the shopping guide, but I understand advertising for companies (and subsequent purchases from said advertisement) is probably a large source of income for Modsy, but I really don’t care about the stupid waste of space Anthropologie lamp, that my kids will knock off the dresser two seconds after it is in the room. I care that my requests are heard and honored and that I am given useful options to fix the design issues I am having. The designs I was offered fell flat, providing nothing I need. * If you want to see your furniture in the space, in addition to the design package you purchase, it will cost you $15 per piece of furniture. 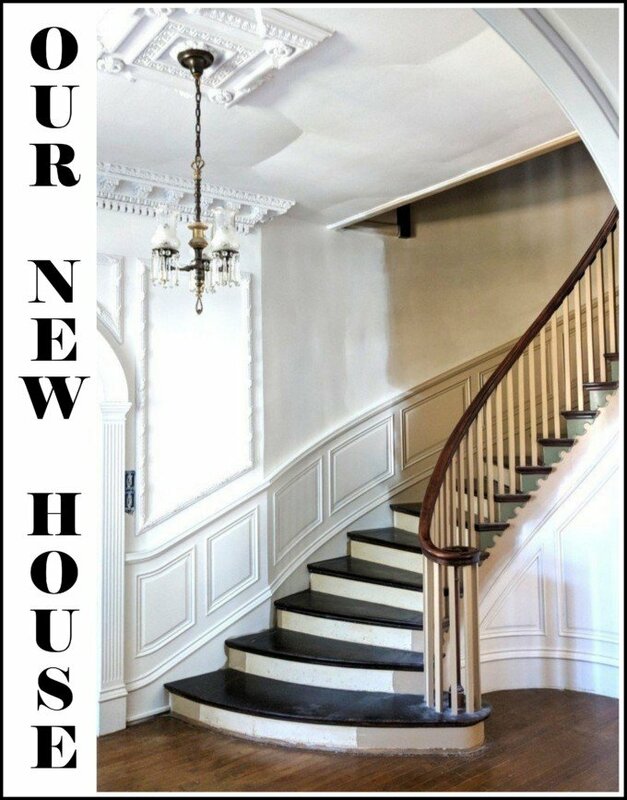 * If you want to see color on the walls, it will cost $10 for paint and $30 for wallpaper in addition to the design package you purchase. 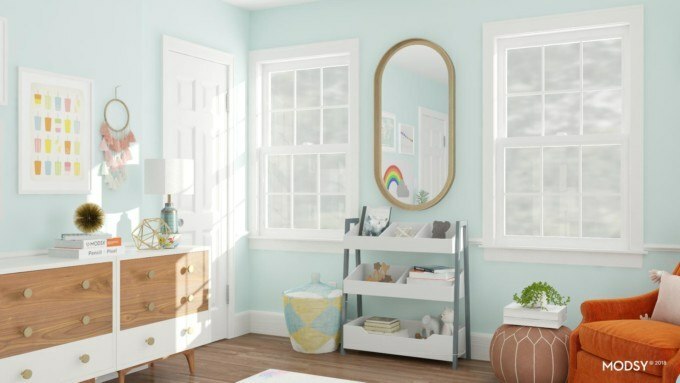 *Modsy cannot move or remove shelves or hooks that are on the wall for their design renderings. 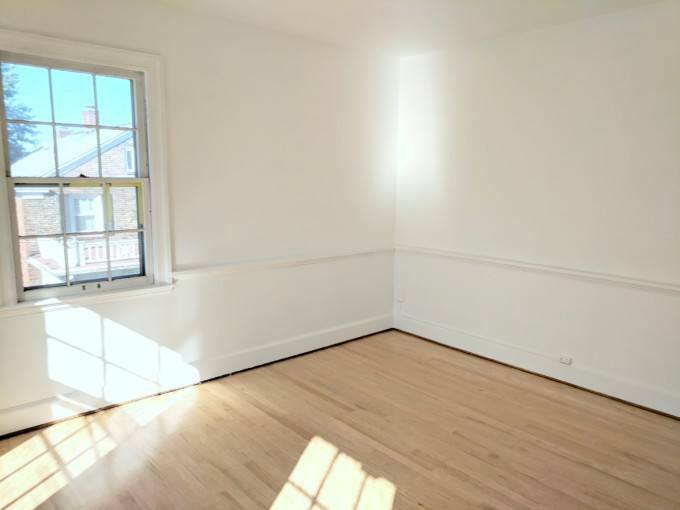 So, if you want to see what a room looks like with something removed, just move it your self/don’t hire a Modsy designer. * Modsy does cannot make a model of your room to offer options for doors-I wanted to see some closet door options as the closet in the room I am working on does not have doors. * If you have something specific in mind, it is easier and faster to do your own internet search for the products you are looking for than it is to have the Modsy team search for you. * While, depending on the package you purchase, the Modsy team will “work with you” or take your feedback into consideration, this interchange can take several days and they may not even do what you requested them to do. 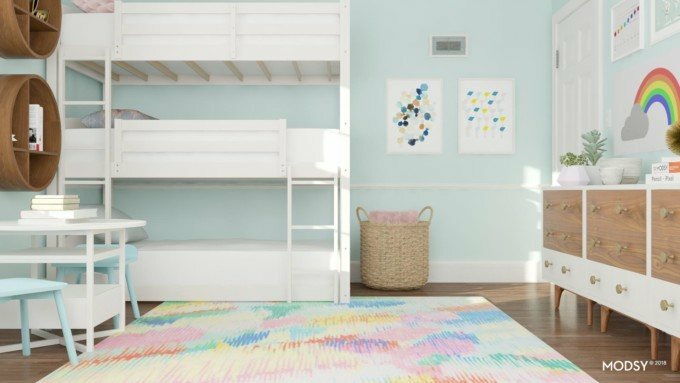 In summation, if someone needs a shopping list, or if the space is large and has lots of potential, or if the space doesn’t have to function as kids room/play room/guest room, then this might be the right service for them. For me, this has been a complete waste of my time, my money and resources that could have been better allocated to any number of different options. I wish there had been some negative reviews for Modsy out there when I was researching, so I would have taken that into consideration and had not thrown my money away. I will not be using this service in the future and feel a duty to share this with others. They are all great! Lovely colours! One thing I would change is, if you are going to put in the small round table, to make sure there are three chairs for it instead of two. Then all three girls would be able to have tea parties and such. Are they even into things like tea parties? I know they love helping you and Nick build and use the power tools. The room is going to be so awesome when you guys are done. I got “Elegant Connoisseur combines Classic Formal and Hollywood Glam with a touch of Transitional.” Sounds good to me! I got Farmhouse Chic – combines Rustic and Hollywood Glam with a touch of Mid-Century Modern. Yessssss! Have hubby take the quiz!